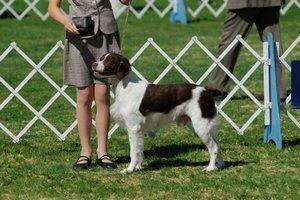 Springer vs Brittany Spaniel: Which breed is the better sporting dog? Generally speaking, sporting dogs make fabulous companions because they have been breed to work so closely with people. They are usually quite easy to train for field work, and the skills they learn there carry over nicely to other activities such as agility trials and fly ball competitions. Energy is never in short supply with sporting breeds; they are always ready to go whenever you are, and simply wait for you to give them the signal. As you might expect, this inbred characteristic of cooperation also makes these dogs wonderful family companions. You can work them in the field, and play and cuddle with them at home. What more can you ask for? Due to their affable natures, they normally get along quite well with other dogs of similar type, with the exception of some smaller breeds that may be perceived more as field quarry than fellow canines. That said, a proper introduction and initial supervision is usually enough to integrate both types of dogs into the same household. In a group of dogs renowned for their grace, beauty and athleticism, two breeds in particular stand out from the competition: the English Springer Spaniel and the Brittany. Let's find out why. 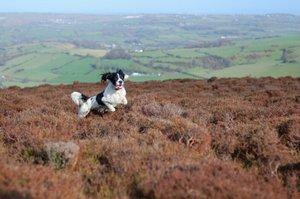 Some sportsmen wouldn't consider taking any breed other than the English Springer Spaniel into the field with them. These dogs are extremely attentive to their owners' every move and practically anticipate their next command. 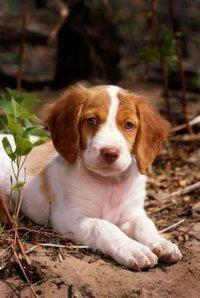 For others, no other sporting dog compares to the talented Brittany Spaniel. The concentration these dogs display when they're on the job is intense, and they certainly can hold their own with the best of the pointer breeds. Is one breed honestly better than the other? Let's do a little side-by-side comparison. Honestly, comparing Springers to Brittanies is like comparing apples to oranges. These breeds are so closely matched that it really comes down to two points: preference and purpose. Which breed do you think is more attractive? The Springer with its handsome ear furnishings and beautiful liver coat is certainly impressive, yet there's something to be said for the streamline, no nonsense build of the classic Brittany. When it comes to good looks, it's all a matter of personal preferences. Purpose is an easier point to define. All things considered equal, do you need a pointer that will reliably find hiding game and retrieve it when the time comes? Then choose the Brittany. If you need a dog that will track down game birds and flush them out into the open for you, then the Springer is the obvious choice. Our advice: get one of each and have the best of both worlds!